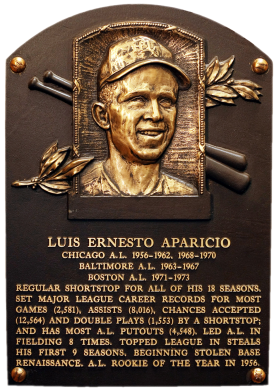 No man played more games at shortstop - 2,581 - than Aparicio. 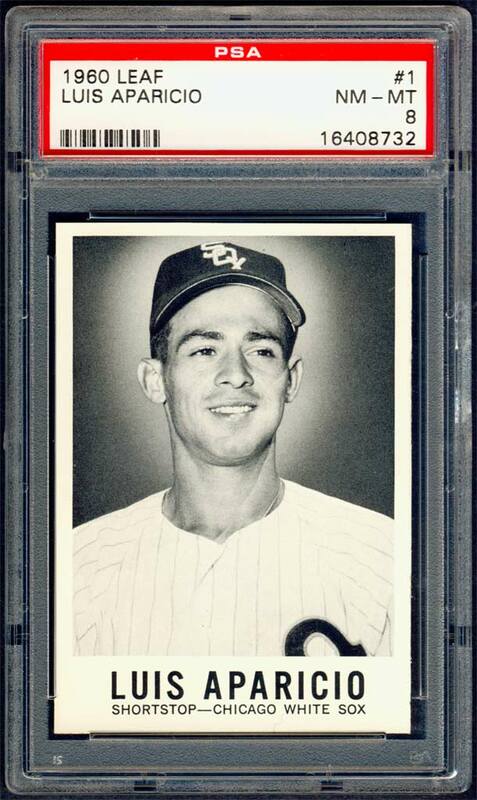 The swift, sure-handed infielder played a vital role in championship seasons for the White Sox in 1959 and the Orioles in 1966. He won nine Gold Gloves and led the AL in stolen bases nine times to a grand total of 506 career thefts. 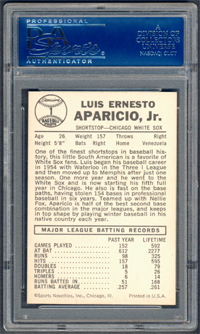 Comments: For Aparicio, I first purchased a 1968 Topps card - a PSA8 and which I subsequently upgraded to a PSA 9 in November, 2002. I thought it was a good mugshot of the Venezuelan star. I also owned a Joe Morgan card from the same set - actually, the first portrait card I ever purchased. 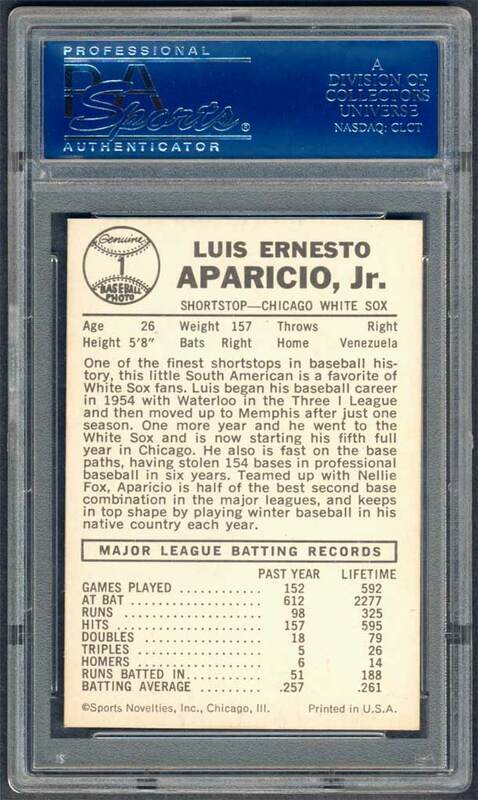 When I decided to diversify the collection and purchase more types, I remember seeing the 1960 Leaf Pre-Production issue in some auction and deciding that it was the card I had to have for Aparicio - loved it. It was a high-dollar item so I figured it was best to start off by getting a regular issue first. I bought a NM raw example on eBay in April, 2007. When received it wasn't quite as NM as it was described. 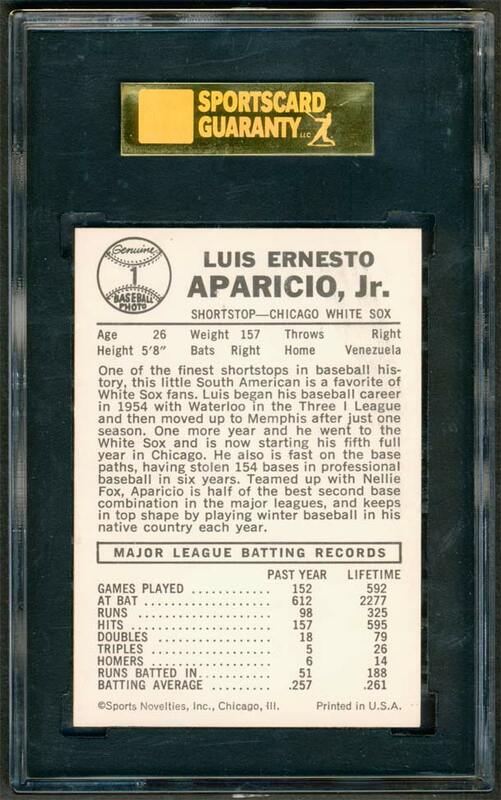 So, I upgraded by purchasing a PSA-graded example in December, 2009 - a NM 7 via eBay. In May, 2012 I found a PSA 8 when I won an eBay auction from seller Howard Engle. I still couldn't quite afford the "Big Head" version so this had to do. Since 2005, only two of the Pre Production cards had popped up in different Mastro auctions (2005, 2007) but I couldn't pull the trigger on either. In August, 2013 another example showed up in a SCP Auction - this beautiful SGC 88 example and I couldn't pass it up. I won the auction for much less than the two previous examples sold by Mastro. I'm really happy to finally own one of these. 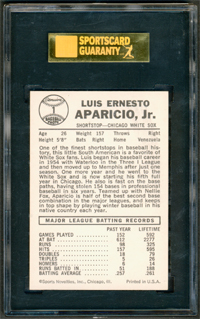 Base: While known to the hobby as "Leaf" cards, this set of 144 carries the copyright of Sports Novelties Inc., Chicago. 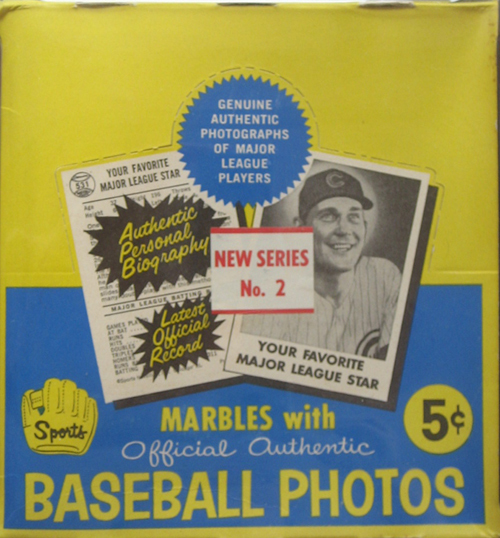 Cards were sold in nickel packs with a marble, rather than a piece of bubble gum. the second half of the set, #73-144, are quite scarce. In the late 1990s, a large group of high-number wax packs - in excess of 4,000 cards - was added to the surviving supply. 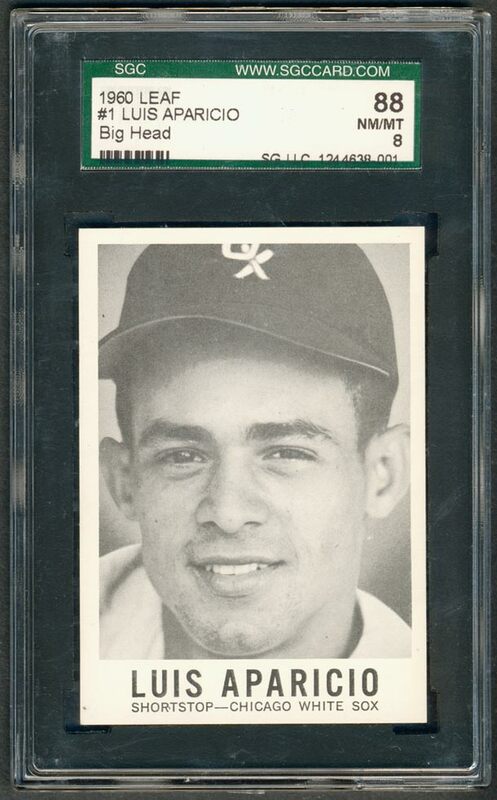 Big Head: Evidently produced prior to final approval for the design of the 1960 Leaf set, these cards all feature much larger player photos than the issued versions. Generally the issued cards have cap-to-waist photos while the pre-production cards have cap-to-chin shots. Backs of the pre-production cards are virtually identical to the regular cards. The pre-production cards were never publically issued and show evidence of having been hand-cut. The cards of Donovan and Jay appear to be more common than the others.